Dr. Michael Schwartz gives potential breast augmentation patients an idea of what to expect in the days following surgery. Thousand Oaks, CA – The American Society for Aesthetic Plastic Surgery (ASAPS) has recently cited breast augmentation as the most popular cosmetic surgical procedure in 2012. 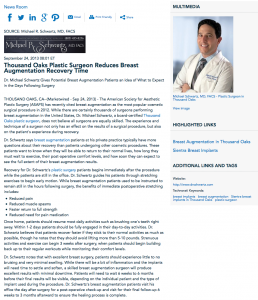 While there are certainly thousands of surgeons performing breast augmentation in the United States, Dr. Michael Schwartz, a board-certified Thousand Oaks plastic surgeon, does not believe all surgeons are equally skilled. The experience and technique of a surgeon not only has an effect on the results of a surgical procedure, but also on the patient’s experience during recovery. Dr. Schwartz says breast augmentation patients at his private practice typically have more questions about their recovery than patients undergoing other cosmetic procedures. These patients want to know when they will be able to return to their normal lives, how long they must wait to exercise, their post-operative comfort levels, and how soon they can expect to see the full extent of their breast augmentation results. Once home, patients should resume most daily activities such as brushing one’s teeth right away. Within 1-2 days patients should be fully engaged in their day-to-day activities. Dr. Schwartz believes that patients recover faster if they stick to their normal activities as much as possible, though he notes that they should avoid lifting more than 5-10 pounds. Strenuous activities and exercise can begin 3 weeks after surgery, when patients should begin building back up to their regular workouts while monitoring their comfort levels. Dr. Schwartz notes that with excellent breast surgery, patients should experience little to no bruising and very minimal swelling. While there will be a bit of inflammation and the implants will need time to settle and soften, a skilled breast augmentation surgeon will produce excellent results with minimal downtime. Patients will need to wait 6 weeks to 6 months before their final results will be visible, depending on the individual patient and the type of implant used during the procedure. Dr. Schwartz’s breast augmentation patients visit his office the day after surgery for a post-operative check-up and visit for their final follow-up 6 weeks to 3 months afterward to ensure the healing process is complete. Dr. Michael Schwartz leads his private practice in Thousand Oaks, CA. He completed his training in plastic surgery at The University of Texas Southwestern in Dallas and has authored and presented numerous papers. Dr. Schwartz has been honored with many teaching awards during his tenure as a board-certified plastic surgeon. Because he is a leader in breast enhancement procedures, he was one of the first plastic surgeons in the US to perform procedures using the Sientra breast implant. Dr. Schwartz is available for interview upon request.